Environmental Health Perspectives is now an open access journal. This means that all research articles in EHP, which is published by the NIEHS, are feely accessible on the Internet. Among the more than 10,000 research reports now available is the startling paper by the Lund University group in Sweden showing that very weak GSM mobile phone radiation can cause leakage through the blood-brain barrier, leading to neurological damage. The Lund paper appeared in EHP’s June 2003 issue and was posted on the Web last January (see MWN, J/F03). The studies on the blood-brain barrier by Lund’s Drs. Leif Salford and Bertil Persson prompted a workshop held in Germany in November. Microwave News was there and we will be posting a report on the meeting soon. 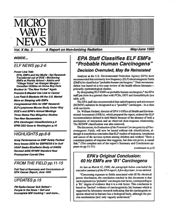 Today it may be more of historical than scientific interest, but EPA’s 1990 evaluation of EMF cancer risks is now available on the Internet at no charge.